Burger King introduced their new Halloween Whopper today. It’s a regular Whopper with A-1 Sauce instead of ketchup on a bun as black as midnight. Seriously. In the spirit of the season I got mine by the light of the biggest, brightest full moon I’ve seen in a while. Then, also in the spirit of the season, I had a terrible accident while trying to cut the thing in half. 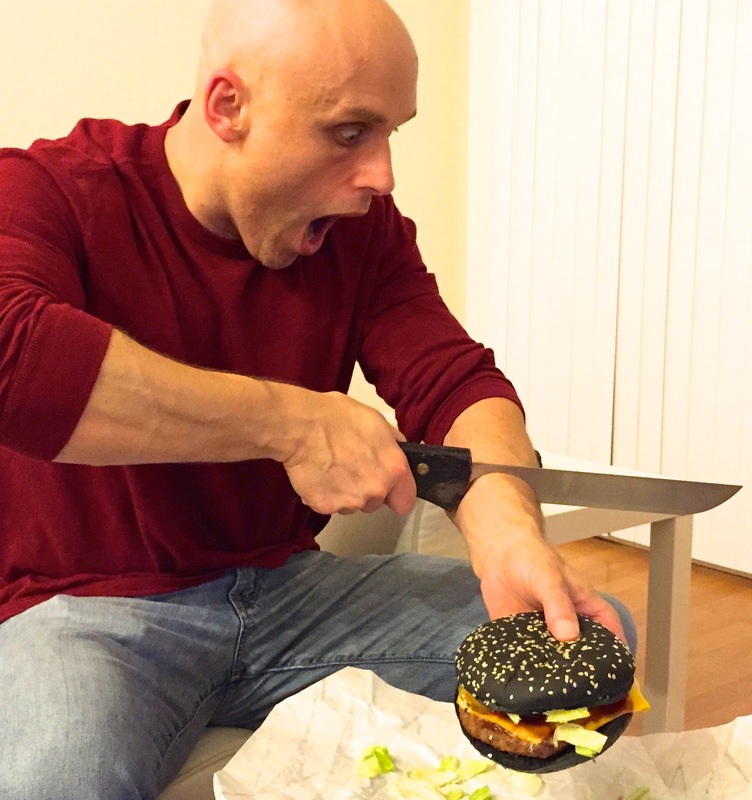 After I bandaged up my fake injury I gave the Halloween Whopper a try. How was it? Well, basically it’s a Whopper and I like Whoppers. I like them a little better when they have ketchup, to be honest, but the A-1 was O-K. I mean, I’d have preferred the original ketchup or maybe some BBQ sauce but it was totally fine and when I hit a strong mayo/pickle bite I honestly didn’t even notice the difference. But what about the black bun? I wondered if it would be pumpernickel or something else weird. Sadly, no. It tasted like a regular sesame seed bun. Then I looked into it. BK isn’t saying how the buns get their jet-black color but it turns out that they tried black buns in Japan last year and they weren’t so cagey about how those things were colored: Squid ink. The buns were tinted black with squid ink. Now that’s scary. The Halloween Whopper is available through… you know.